Jan Miller BSc., author of 'Gardening for Butterflies, bees and other beneficial insects' (see books section), runs Saith Ffynnon Wildlife Plants. She designs wildlife gardens which have won 'Britain in Bloom' gold medals and has been a very active volunteer for Butterfly Conservation for 12 years. Currently chair of North Wales Wildlife Trust, Clwyd Branch; Trustee of the Wildlife Gardening Forum and member of the Garden Media Guild. Jan and the National Collection of Eupatorium were featured on BBC2 Gardener's World on Friday 4th October, you can see the clip on our Home page. Saith Ffynnon means 'Seven Springs' or 'Seven Wells' in Welsh. We live on a spring-line between limestone and neutral loam near the North Wales coast, and hence have a moist and gentle climate where we grow lots of wildlife gardening plants - from butterfly-attracting flowers to coloured willows to feed caterpillars that feed birds and bats. We have 8 acres where there is a wildflower meadow, butterfly garden, natural ponds and woods, and also the National Collection of Eupatoriums. We are not a garden centre that is normally open to visit - but you are welcome to contact us for an appointment to come and see the gardens and wildlife projects. All our plants are grown in peat-free compost, often mixed with white perlite (a natural inert mineral product) and kept in as small pots as possible (average 4-inch) to reduce weight and thus keep postage costs to you as low as possible. Most of our plants are propagated by us here. Some wild plants are sent out bare-rooted as they do not grow at all well in pots. Just wanted to say thank you so much for the plants you delivered last week, they are wonderful (thanks for the extras! ), all planted out and I'm looking forward to a beautiful display. I will be placing another order with you over the next few weeks. Thanks, Jan - tree arrived in good condition (well-packed!). Lovely root system. My plant arrived before lunch, beautifully packed - what great service. container) and sitting in a sheltered part o the garden. Just a quick note to say that the parcels arrived on Saturday morning. We cleared the green slime from the polytunnel pond and got the new oxygenators in straight away. Pond looking much cleaner after only a few hours. Have transferred the tadpoles back in and frogs have returned of their own accord. All much improved. You mentioned that you hadn't been able to supply the range of varieties that you would usually be able to at this stage in a warmer year, but the quality and quantity of what you supplied looks to be very good. Plant arrived safely, well packaged and in excellent condition. Thank you very much for prompt delivery. I look forward to placing more orders with you. 25th June 2011; just wanted you to know the plants arrived in plenty of time, the new garden (to remind my mum of coastal holidays) was planted up yesterday and she was thrilled. Thanks a lot for your help - much appreciated. Excellent customer care! the plants arrived in great condition - there was even a worm in with them - and they have all taken well in the garden. 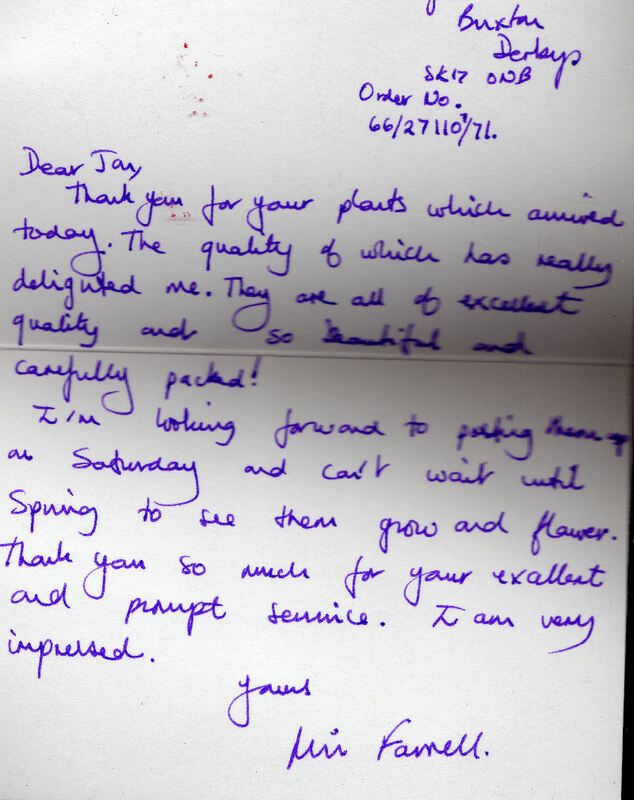 Dear Jan,Many thanks for your email and excellent service - the plants arrived safely this morning. Thanks, too, for the butterfly conservation information. As a member of the Bumblebee Conservation Trust, I am trying to make my garden more bumblee-friendly but it's good to know which plants will also benefit butterflies and moths. Received the plant this morning, thank you so much, not too much the worse for wear, already planted in, the root system on it is very good, so looking forward to seeing it flower. We have changed the house name to Meadowsweet, has taken 5 years to find a name I really am happy with. Thanks again and I will keep an eye on the web site for anything unusual. Fantastic delivery, thank you, received my order YESTERDAY. Plants are really healthy specimens , will certainly use again and will recommend. Plants arrived safely this morning. Thank you very much for all your help. I look forward to obtaining further supplies in the future. Thanks ever so much for the packet that you sent me - seeds and literature. I actually had 16 species in my garden on July 17th this year. I have an acre but 1/2 is natural grassland which attracts the likes of C.Blue, Small and Essex Skippers, Ringlet, M.Brown etc. Fingers crossed for a healthy patch of Eupatorium in a couple of years. Received plants at 8:00am Weds. No damage at all. Lovely little plants. Have got some bagged farmhouse manure to dig in before planting at the weekend. I will send pictures to you in 3 years when hedge is fully grown, I hope ! :) Many thanks. Dear Jan, Many thanks for the all the info you have sent for planting our Bog Myrtle. We will give it our best shot and lets hope they grow well. Thank you again, Tom Brooke. Thank you very much for the lovely kidney vetch plants. Two beautiful buckthorns arrived safely today in superb condition. They are lovely, healthy plants with very well developed roots; now heeled in ready for planting tomorrow, one in the new little village community wildlife garden and one in our own little garden. We do see yellow brimstones in this village, and perhaps one fine day we may have the thrill of eggs laid on our new buckthorns ! I am so delighted with the quality of your plants, the low price, the careful packing and your surprising speed of delivery, just thank you so, so much. Thank you too for enclosing the Butterfly Conservation literature which is particularly useful because I've been out of touch for a long time. I'll certainly be joining in the Moth Count. The plants arrived safely this morning. They will go in as soon as possible. What a pity the weather is now so cold! I must tell you how impressed I am with your service. You have been so helpful and the information and guidance you've sent is so good plus emails every step of the way and instant delivery! Thank you very much. I shouldn't be at all suprised if I order from you again! The verbenias arrived safely yesterday - very robust packaging, so no problems ! Hope that the cheque has arrived with you. Dear Jan, I am really impressed by the efficiency of your business system- there are many much larger commercial organisations who could learn a lot from you!If this planned planting works I will send you a photo in a year or two. thanks for getting back to me so quickly. the plants are doing great .If you can do all that that will be great and that cost is fab Thankyou. Many thanks for your speedy reply and advice. I've taken a picture for you (attached). I planted it in a pot soon after receiving it. The root ball was still very wet when I planted it and as far as I know it hasn't been allowed to dry out. It has been outside all the time, first of all in a sheltered part of my patio. Couple of weeks ago I moved it out into the sunshine, where it is now in the picture. Thank you very much for the offer of sending a new cutting. It's now end of May and I'm reporting on my Eupatorium ligustrinum. Well, I'm really pleased to say that it's at last showing signs of life! ?As you can see from the attached pic, new shoots have suddenly started appearing from the bottom, which was a total surprise when I first noticed the other morning! Tiny green shoots had already been appearing on the stems higher up. So fingers crossed it will be okay now, looking forward to the flowers and butterflies! You may remember I bought a Eupatorium ligustrinum a year ago and I've been very pleased with it. My cousin has fallen in love with it too and wants one for herself. dear Jan.........how lovely to speak to you......and to find someone who really does know their stuff. please find attached our design as it currently stands. we are now working this up for the main presentation which has to be in by the end of the week. I like the idea of the buddleia lots and perhaps the wild ivy forming a carpet on the horizontals - is this enough food for the little ones! Hi.My order has been received, very quick delivery.Thank you for adding extra stems it was most thoughtful of you.They all look to be just what I wanted.So once again thank you for your fast and helpful service. I read a review of your 'How to' book in the RHS Garden magazine and bought a copy straight away. I wanted to tell you what an inspiration it has been, and that I have used some of the ideas already to increase the biodiversity in my own garden. One of our small aviaries now has a sedum roof, and a thyme version is in progress for the bike shed. The pond edges have been improved through implementing the moraine garden idea. As well as these projects, I have sown seed for Birdsfoot Trefoil, Vipers Bugloss and two of the ornamental Hemp Agrimonies - really pleased to see that the latter have just germinated today, and the former are getting going nicely. When I noticed an 'infestation' of caterpillars on my Kohl Rabi, I decided to leave them be - they had a good feed but soon disappeared and the Kohl Rabi has hardly suffered at all. One of the bonuses is in human terms. The lads at Thorncliffe became interested when I went to seek out some lightweight aggregate. My neighbours wanted to know what it was all about, and my grandchildren have also got involved. Since the best view of the sedum roof is from the music studio upstairs, various visitors are also asking questions. So thank you, Jan. I hope all is well with you and yours. On 3 Sep 2011; Excellent Book, many thanks. Great service too!